Denim and snake print is a pretty fun combo, but instead of wearing plain denim with my snake printed skirt, I decided to kick it up a notch with a tie-dyed shirt. Tela vaquera y estampado de culebra hacen un combo muy divertido, pero envés de ponerme una camisa sencilla vaquera con mi falda, me decidí ponerme una desteñida para darle más sabor al look. Shirt/Camisa: Men's Vintage. (also worn HERE). Check this out by ASOS or another similar HERE. I am smitten with the shoes, lovely ensemble!! 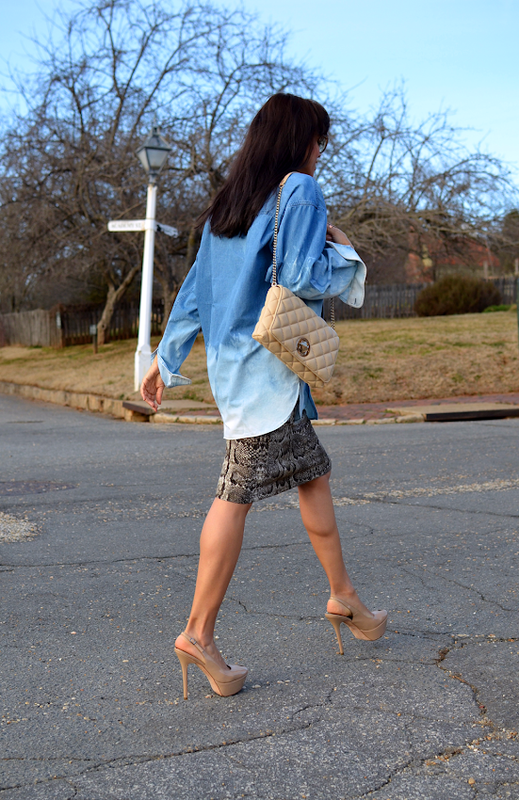 I love this look - the oversized chambray works really well over that unusual print. Cute! Que look tan divertido! Me encanta como juegas con los prints y las proporciones de la ropa. Esos zapatos están divinos, me enamoré! Thanks so much Christy! and btw, I love how you styled H&M yellow sweatshirt. Been looking for something like this for the longest time ! Thanks Dominica! Try Ebay or even Etsy.